Download "JOB AND TASK DESCRIPTION"
1 JOB AND TASK DESCRIPTION Job Title: IT Support Specialist (2 nd Line, Reporting and Monitoring) Division: Corporate Services Division Grade: J Reports To: IT Infrastructure and Operations Manager General information The Information Technology (IT) Section forms part of the Corporate Services Division (CSD) and serves as a focal point to establish technology standards of relevance to the Secretariat s local environment, while applying and supporting the use of computer technology to enhance staff productivity and improve the quality of the Secretariat s output. The Section contributes to the Secretariat s IT strategy and contributes to the proper selection of technologies by providing information on advanced and appropriate technology, systems analysis and software acquisition. The section aims to assist all programme areas in meeting their specific information requirements and plays an active role in the building and upgrading of the skills and knowledge of staff in the use of computers and relevant software applications. The Support team s role is to ensure that the existing office and associated systems are fully functional at all times, therefore contributing to staff productivity and improving the quality of the Secretariat s output. The team is also involved in recommending and implementing new systems and upgrades as appropriate. The team also plays an active role in the building and upgrading of the skills and knowledge of staff in the use of computers and relevant software applications as well as supporting a network of desktops, servers and associated printers and peripherals. Job summary The IT Support Specialist is responsible for providing technical support for a full range of business technology, including computer systems (hardware and software), network infrastructure, telecommunications circuits, mobile devices, telephone systems, and audio-visual equipment. S/he must be able to independently assess a reported problem or failure using diagnostic methods and tools, determine the likely cause and take appropriate action to resolve the problem in a timely manner. Often collaborating with other resources (both internal and external), the IT Support Specialist must understand system interdependencies and avoid unintentional interruption of services during troubleshooting and problem resolution. 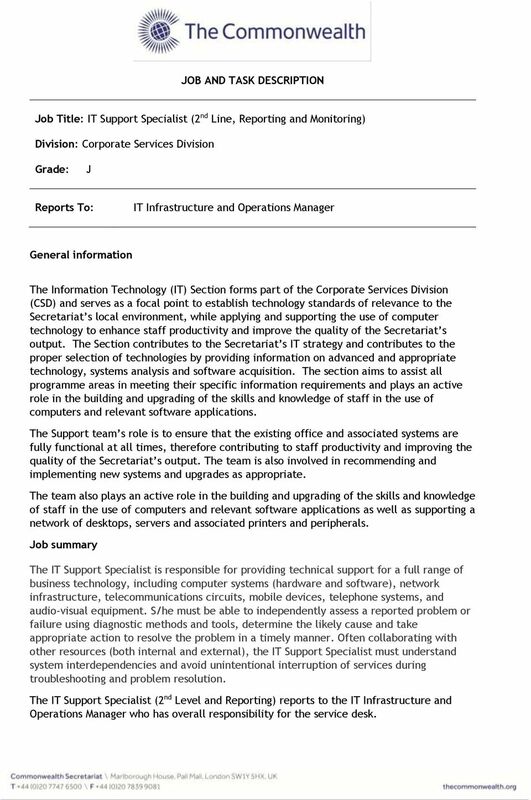 The IT Support Specialist (2 nd Level and Reporting) reports to the IT Infrastructure and Operations Manager who has overall responsibility for the service desk. 2 Task description The post-holder: Maintains full ownership of ticket through its lifecycle and Incident Management process. Ensuring all elements of the process, including Major Incident Management are implemented and operationally managed. Maintains the Lessons Learnt Log. Maintains various Policy and Procedure documents. Provides first call resolution or triage for all calls. Provides reports to an agreed schedule (or on request), including management summary, KPIs and detailed performance reports. Ensures accurate logging incidents, service requests, access requests and changes. Ensures that for every call and/or reported event a ticket is created in both a timely and accurate manner. This one call/one ticket method provides effective tracking of all incidents and service requests. In the cases where a single incident has effected multiple users, this method of creating a ticket for each reported instance and attaching it to a master ticket will allow for impact analysis on the outage. Ensures updates to the Knowledge Base (KB) with all troubleshooting performed and, if applicable, the resolution are made. Utilizes the KB and other support documentation to identify, isolate, diagnose and resolve end users technical problems and provide information and status as requested. Completes initial diagnosis and progress all issues in a timely fashion to meet customer SLAs, resolving the incidents wherever possible. Escalates tickets to the appropriate Specialists if required. Forward tickets/requests to 3rd party suppliers where necessary and manage progress of these through to closure. Monitors Risks, Issues, Action Logs and Dependencies. Manages service desk mailbox. Manages analyst performance on a monthly basis with focus on adherence to SLA achievement, customer focus, proactive problem solving and incident avoidance, expected telephony occupancy. Schedules engineers to conduct incident activity. Works with engineers to resolve incidents. Supports room based video conferencing. Reviews call logs and trends. 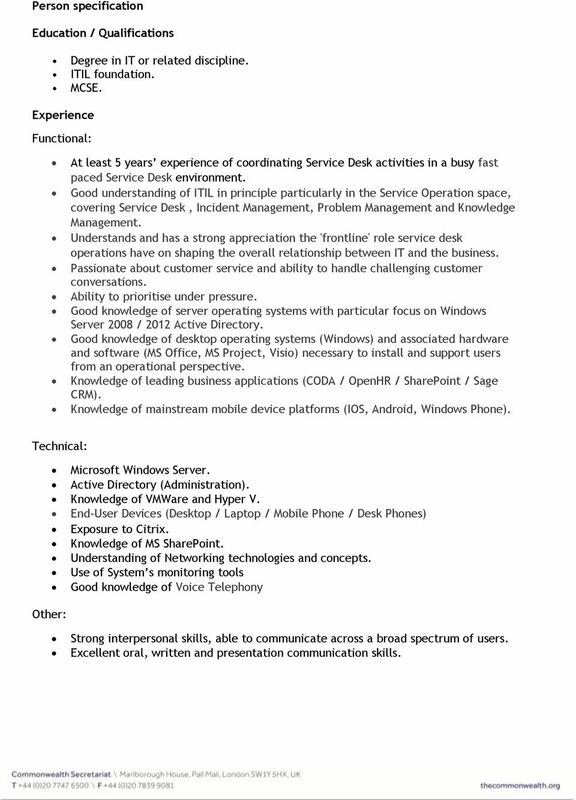 Any other tasks or projects assigned by the IT Service and Infrastructure Specialist. Provide occasional out of hours support. 3 Person specification Education / Qualifications Degree in IT or related discipline. ITIL foundation. MCSE. Experience Functional: At least 5 years experience of coordinating Service Desk activities in a busy fast paced Service Desk environment. Good understanding of ITIL in principle particularly in the Service Operation space, covering Service Desk, Incident Management, Problem Management and Knowledge Management. Understands and has a strong appreciation the 'frontline' role service desk operations have on shaping the overall relationship between IT and the business. Passionate about customer service and ability to handle challenging customer conversations. Ability to prioritise under pressure. Good knowledge of server operating systems with particular focus on Windows Server 2008 / 2012 Active Directory. Good knowledge of desktop operating systems (Windows) and associated hardware and software (MS Office, MS Project, Visio) necessary to install and support users from an operational perspective. Knowledge of leading business applications (CODA / OpenHR / SharePoint / Sage CRM). Knowledge of mainstream mobile device platforms (IOS, Android, Windows Phone). Technical: Microsoft Windows Server. Active Directory (Administration). Knowledge of VMWare and Hyper V. End-User Devices (Desktop / Laptop / Mobile Phone / Desk Phones) Exposure to Citrix. Knowledge of MS SharePoint. Understanding of Networking technologies and concepts. Use of System s monitoring tools Good knowledge of Voice Telephony Other: Strong interpersonal skills, able to communicate across a broad spectrum of users. 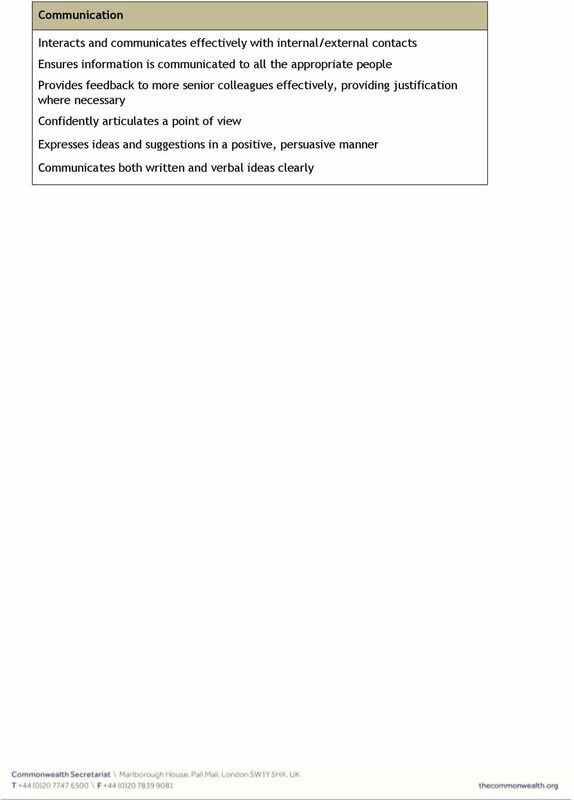 Excellent oral, written and presentation communication skills. To provide an effective, professional and customer focussed ICT Service Desk service to the customers of the Council, NHS and all Hoople customers. We are not a complacent community; all staff are keen to learn and improve, developing pedagogy through research, shared practice and innovation. H10220, page1. Nothing in this job description restricts management's right to assign or reassign duties and responsibilities to this job at any time. JOB DESCRIPTION. Be responsible for ensuring the implementation of standard operating procedures (SOPs) and systems documentation. 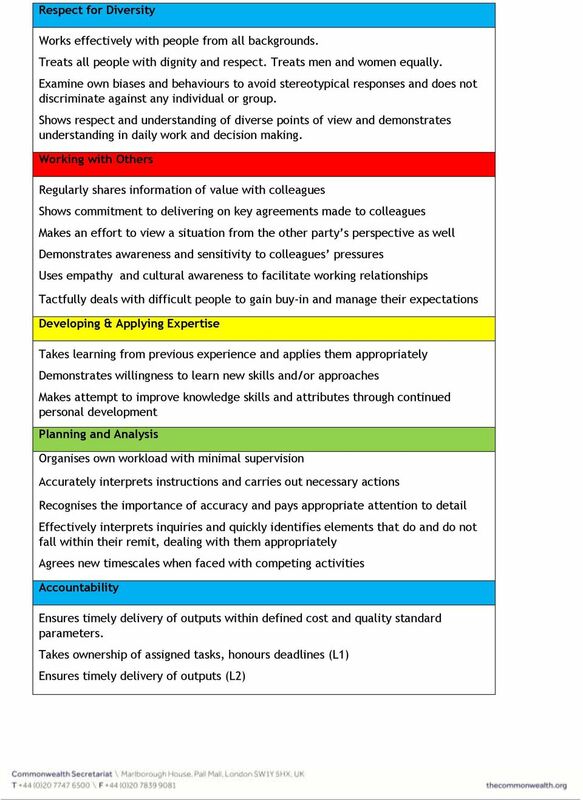 1.1 In consultation with management, to identify against business objectives, issues of self-development and training. Technical Support Engineer. Job Description. 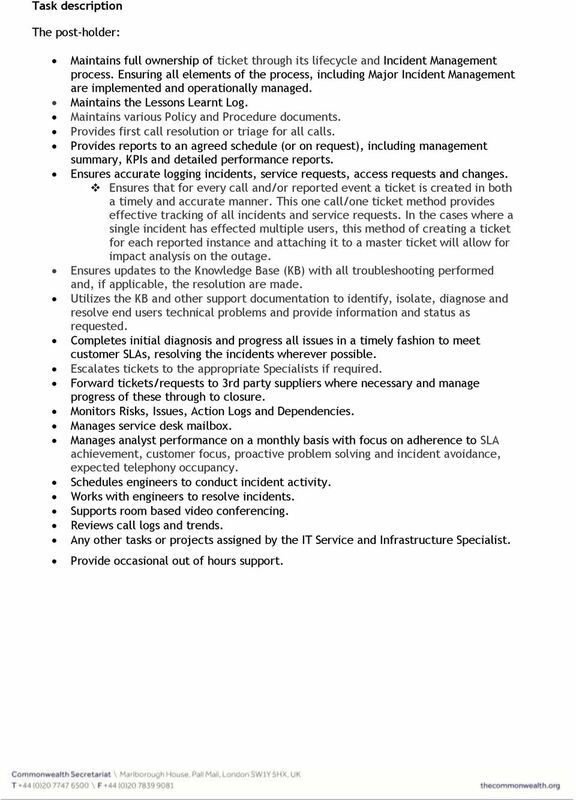 The Service Desk Manager is responsible for the performance of the Service Desk down to the individual level. JOB DESCRIPTION 1. JOB IDENTIFICATION. Service Desk Analyst. Job Title: Date this JD written/update: 05/09/08. Job Reference Number: 2. Communicate: Data Service Level Agreement. Author: Service Date: October 13. Communicate: Data Service Level Agreementv1. Responsible for: To provide 1 st and 2 nd line support to users of the College ICT facilities and assist with software and hardware installation.